Attack of the Clones: Send in the Clones! I will admit that I’m pretty fond of my Super Joy 3, but lately it has been giving me problems. I think the batteries are going dead, but with anything made in China, it may also just be dying for good. Recently I found a functional Power Joy that may take it’s place, so I figured what better to do than to give the Power Joy it’s own review! New (Left) and the old one (Right). 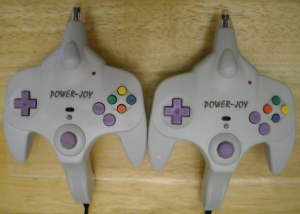 The Power Joy also has the N64 controller resemblance, but takes it a few steps further from the Super Joy, for the integrated light gun. The first thing you’ll notice is the toy jet design on the front, as well as the toy gun like handle, with trigger, underneath. 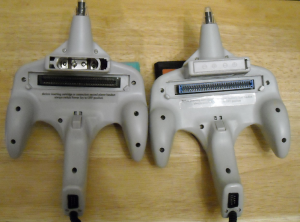 The toy jet design may have been added to throw off the N64 controller shape, but the handle and trigger are essential and feel quite comfortable when you’re playing one of the many shooting games packed into this unit. Also, the light gun’s accuracy is surprisingly good! Black is the new one and blue is the old one. At the bottom of the handle is the second controller port, as well as the hardwired AV cables, with optional power input. The cables are decent in length and don’t get in the way, despite their placement. Underneath the unit you’ll also find a 60 pin connector and the battery storage, which has an extremely weak feeling cover. The Power Joy does play Famicom cartridges, but the unit isn’t quite big enough to play them comfortably, so your fingers might be cramped until you find a comfortable playing position. 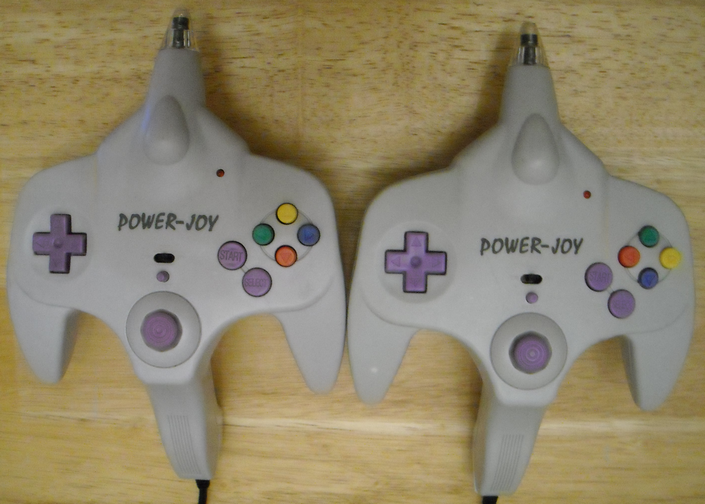 On top of the Power Joy are the controls, which are setup much like the Super Joy’s, but with a few exceptions. Here the D pad is still inaccurate, the reset button is much smaller but still too easy to hit in a hurry, the power switch is right above the reset button and start and select are the same. One feature the Super Joy lacks, but I enjoy on the Power Joy, is a fully functional joystick, which is more accurate (just slightly) than the D pad. A minor drawback is that the A and B buttons (including their turbo counterparts) are backwards, which takes a little time to adjust to. My new Power Joy came with the cartridge, so I had a chance to see what it could offer. I honestly think the cartridge alone was worth the $3 I paid for the whole unit! The PJ-008 is packed with playable games, and it even works on the NES, with a Famicom to NES converter. Out of the 84 games on the cartridge, there are only a handful of failures. That isn’t to say they’re not functional, they’re just not games I enjoyed. It is noteworthy to say that most of the games packed on the PJ-008 are simply pirated, very few are hacks. I like it, just not that label! Overall, again, I am impressed with this cheap, Chinese toy. I enjoy sitting in front of my TV and having many choices right at my finger tips, which the Super Joy and Power Joy units provide in abundance. The controls are whacky, the games are mostly pirates or hacks of games we already know and love, but this system is a pretty cool little device. Thanks to my new Power Joy, I now know that my other Power Joy works as well, it just needed the battery cover to power up properly. I don’t expect them to live long, but for what they are, I will enjoy them as long as I can. Here is the list of games that the Power Joy offers, as well as the PJ-008 cartridge. I know they released a few different versions, so I would imagine the games differ from cartridge to cartridge, so this is a list of what I’ve got on my system. Gotcha LJN’s Gotcha! I like this one, since the Power Joy is also the light zapper!